‘Ello me Old Chinas and welcome to East London for The Doctor Who Festival at London ExCel! 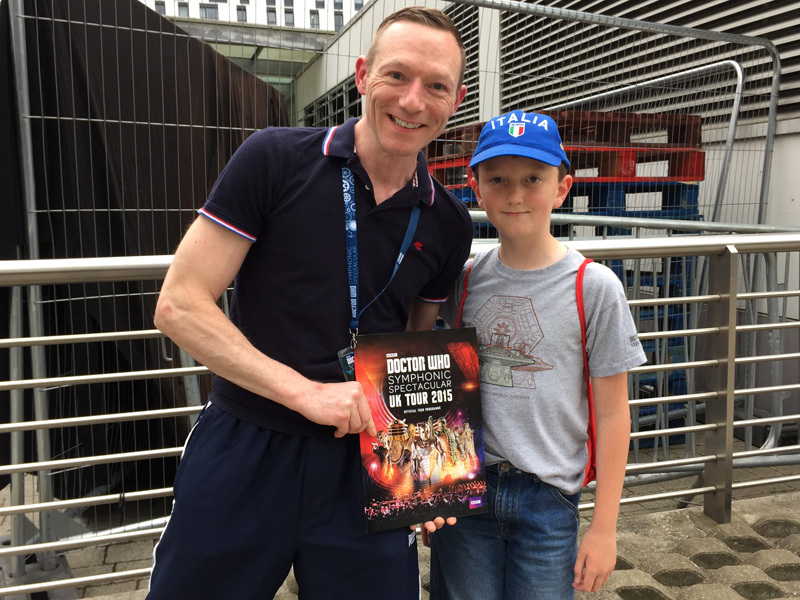 I was really excited to be going to an official Doctor Who Festival and was honoured to be given a Press Pass to report on the event for my Project Indigo readers. 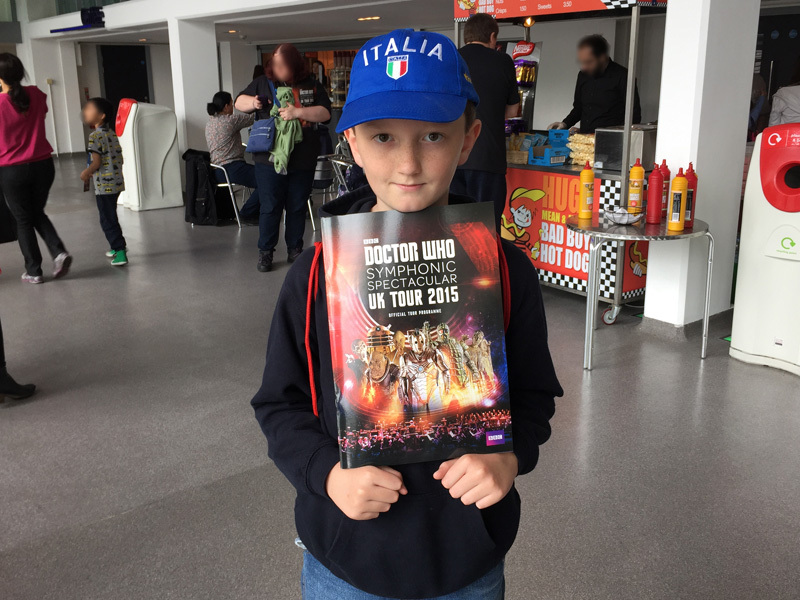 The Doctor Who Festival ran from the 13th-15th November 2015. I went to the festival on Saturday and spent the night before in Greenwich as the festival opened its doors to the public bright and early and I didn’t want to miss a thing. 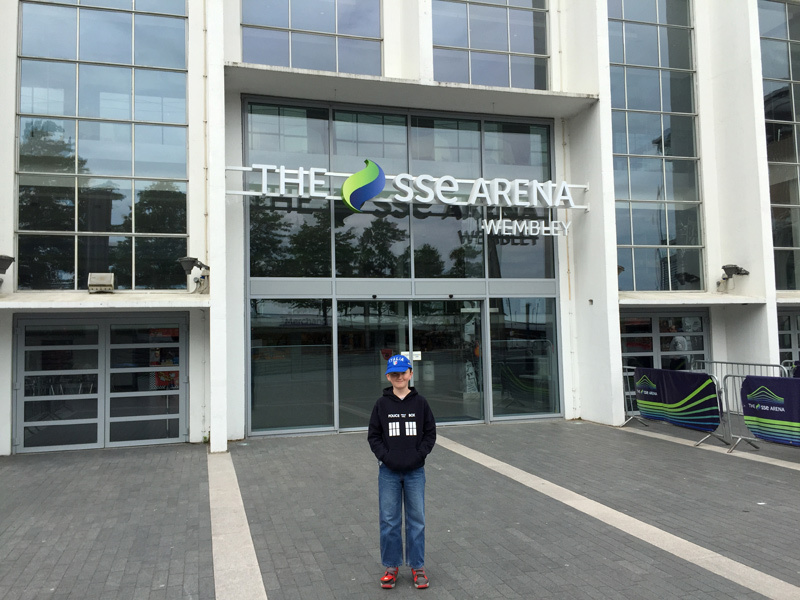 I travelled to the Excel via Docklands Light Railway and got off at Custom House station. The Excel lives up to its name as it is XL! It is so big that there are 2 DLR stations either side. As soon as I collected my Press Pass from the Boulevard I went up to the Press Lounge on Level 3 to introduce myself and say thank you to BBC Worldwide. I was really happy to meet Cath who arranged for me to have my pass. It was a spacious room with free refreshments, and new merchandise on display. I was also able to take home boxsets of Doctor Who Series 9 Part 1 and The Ten Christmas Specials in exchange for a donation to Children in Need. 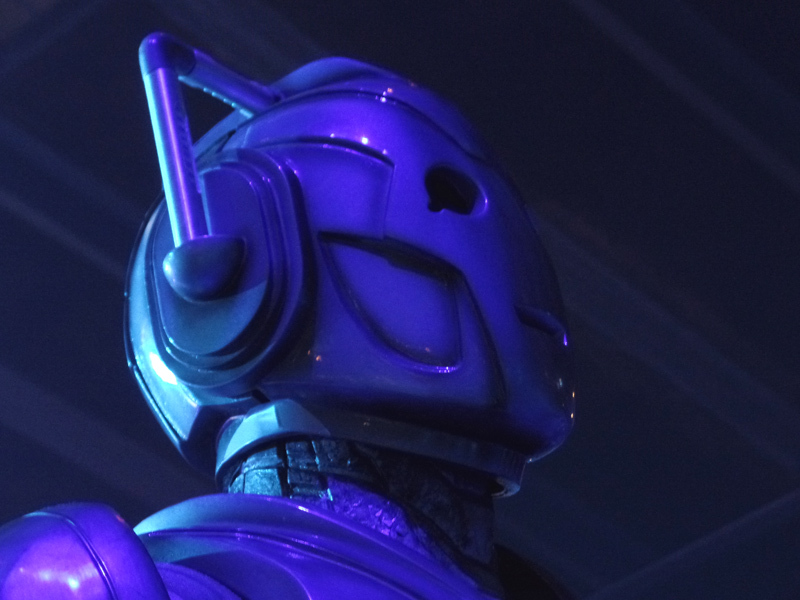 The Festival goers were divided into Daleks and Cybermen. I was part of the Dalek stream which meant that I went to the Main Theatre shows with the writers and cast in the morning. First I went to the Drama School for the ‘Act Like a Monster’ show with voice of the Daleks Nick Briggs and Dalek actor Barnaby Edwards. They needed three victims volunteers to perform in a show about ‘Davros’ Diabolical Daleks’, playing a Dalek and UNIT soldiers. Barnaby said that there has been no change in how to operate a Dalek in 52 years. A Tenth Doctor Cosplayer called Ash played the Dalek – that’s the only time there’s ever been a Doctor inside a Dalek apart from Into the Dalek (2014)! Ash said that it was hot and claustrophobic inside a Dalek. The Dalek came apart like a wedding cake and I got a good look inside. Dare I look at what is under here? The show was a laugh and good fun to watch. Afterwards there was a Q&A and someone asked what other Doctor Who characters they would like to play. Barnaby said The Brigadier and Nick said The Doctor! 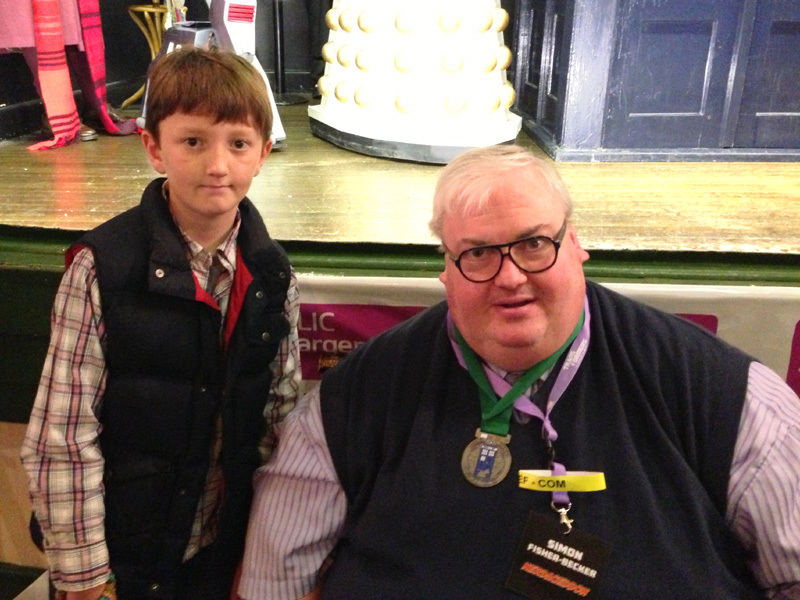 I got to meet the Dalek himself, Barnaby Edwards, which I was really pleased about. After the show I had to rush off to the Main Hall to Meet the Writers! I was really looking forward to this part as I am considering being a writer myself. I already have lots of ideas for Doctor Who stories and I would love to develop the scripts and see them on the TV screen one day. On the way in everyone was given a script from The Magician’s Apprentice (2015). The writers on Saturday were Steven Moffat, (Steven says his title is not Showrunner as the Press call him, but Head Writer) Sarah Dollard and Peter Harness. There was a Q&A and they offered advice for other writers. Steven says he cries a lot and thinks he can’t finish a story – and his wife once filmed him to remind him he thinks that all the time! Someone asked how to cure ‘writer’s block’ and Steven said there’s no such thing, it just means you are stuck! Steven needs a Swear Jar because he has a potty mouth – Ha Ha. Sarah said that when she learnt about ‘Trap Streets’ she knew she had to write a story about them and Face The Raven (2015) became an ideal story for Doctor Who. The writers talked about a ‘terrible event’ that she had to write into the story – we know what that is now. Poor Clara, and poor Sarah for having to write it! Peter wrote The Zygon Invasion and The Zygon Inversion (2015). 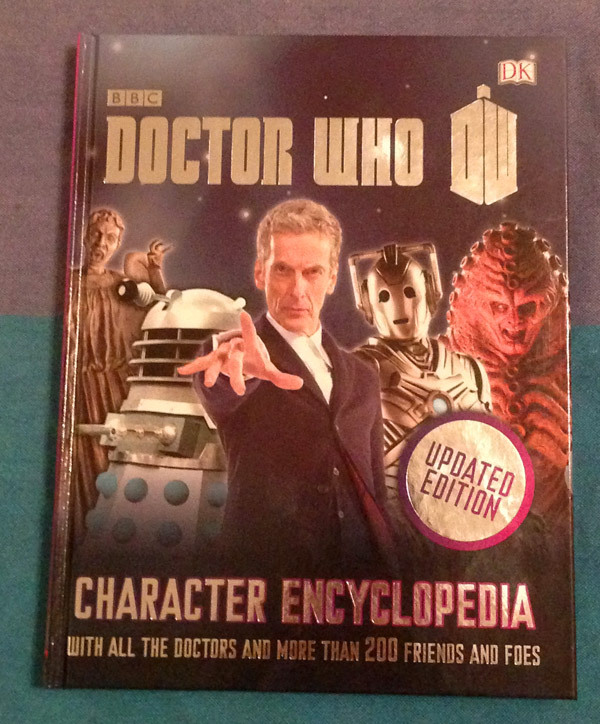 I really enjoyed those stories and would be really happy if he writes more about the Zygon stories in the future. After the trio went off the stage there was a short break then time to Meet the Cast! 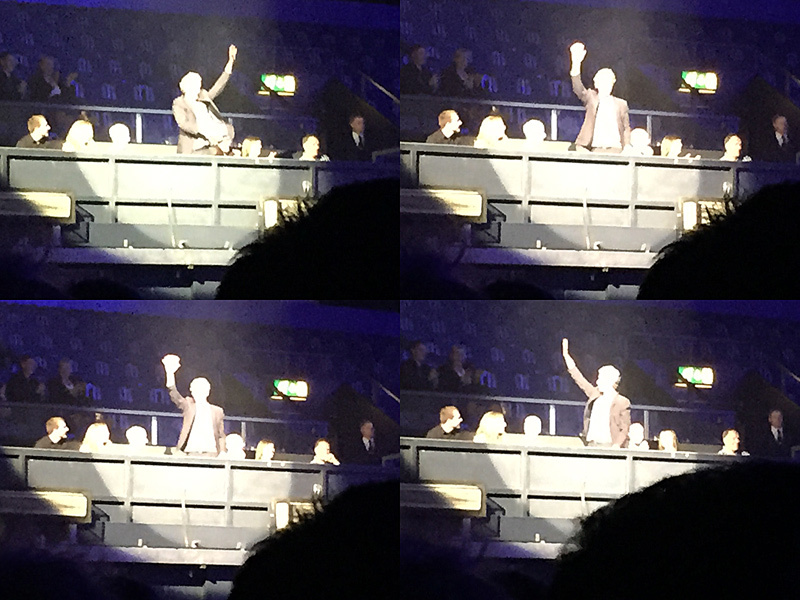 Out came Peter Capaldi, Jenna Coleman, Michelle Gomez and Ingrid Oliver along with Steven again. There was a big eruption in the room because everyone was so excited to see them. It was a definitely a day out for the Peter Capaldi Fan Club! Peter bowed to Jenna as she is currently playing Queen Victoria. 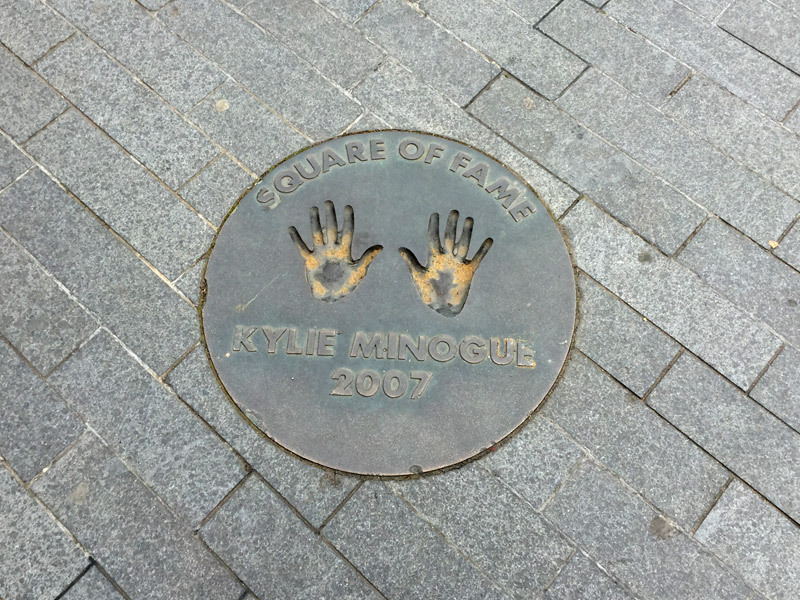 I wonder if she will set up Torchwood in the story? We watched some clips and looked at some pictures, then the cast answered some questions. Steven was amazed that there was a petition to bring back the Sonic Screwdriver. I quite like the sunglasses, I think the Doctor should stay with them. I think sunglasses are cooler than screwdrivers. Someone asked Steven if he would set a story in Ireland. Steven said that Wales can look just like Ireland and if they went abroad to film it would have to be as different to Wales as possible to be worth the money to film there. That makes it easier for me to visit Doctor Who locations! Is that what I think it is? It must be the real one as Peter Capaldi walked out of it. Great minds think alike! The cast think of some answers. The cast were asked what monsters they would like to bring back? Peter said the Zarbi and the Menoptera and Steven said the Sea Devils. Later they were asked what companion they would like to bring back. Peter and Steven said ‘Clara!’ at exactly the same time. They made Jenna feel guilty for dumping them! Meet the Cast was a great opportunity for everyone to ask questions about Doctor Who and daily life on set, the team really know how to look after their fans. What’s weird about this TARDIS? It’s made of Lego! After a quick lunch (veggie sausage roll) I went to Stage One to a talk about the game Lego Dimensions. Mark Warburton from TT Games was there to tell us about bringing the Doctor Who characters into the Lego Dimensions world and answer questions from the audience. Stephen Moffat helped create the Doctor character so that he was just right. Mark said everyone felt it ‘was about time the Doctor had his time in the sun!’ He also said that as Whovians they put Missy in the game when her identity was a secret, so that they could find out who she was! Whilst I was at the Lego talk I met my friend George aka Mini Matt Smith! I have been friends with George online for yonks but it was finally time to meet in person. 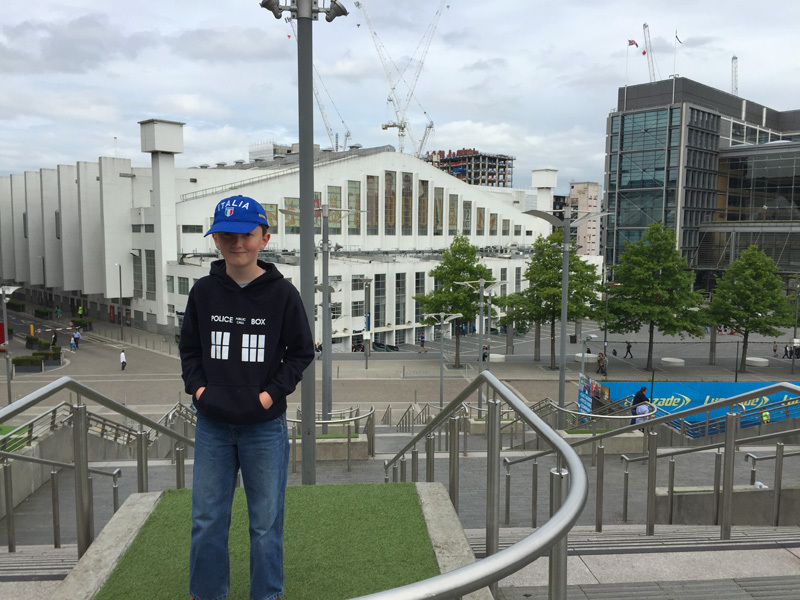 As Mini Matt Smith he is a Youtuber with lots of fans and he has interviewed many Doctor Who stars including Peter Capaldi onstage at the Series 9 Premiere! George invited me to visit him in his TARDIS which I hope to do. Sadly we live 200 miles apart but I will definitely take him up on the offer one day! It was really nice to meet George and his family. After the talk and hearing about the features of Lego Dimensions I was convinced I wanted to play it so the Press Lounge was my first stop. The graphics were amazing, like everything else about the game, and I really liked the way they made the Daleks out of Lego. I played as the Twelfth Doctor and also saw K-9 and Batman. The chemistry is still forming between the Doctor and Batman, but they will make it! I played for as long as I could until I had to let someone else have a turn. I hope Father Christmas brings me the game because I CAN’T WAIT TO PLAY AGAIN!!!!!!!!!!!!!!!!!!! After I left the lounge I went back to Level 1 and explored an Iconic Room Set. This was Davros’ Sick Room from the Series 9 two-parter opener The Magician’s Apprentice and The Witch’s Familiar (2015). It really felt like you were in the episode and Davros looked real, but I was brave. It was a bit smaller than I expected and I wondered how they fit the cameras onto the set. The props looked so hard to make so Millennium FX must be very good at their job. In Davros’ Sick Room. This Sick Room is SICK! Guess which episode these props are from? Next I went to the MFX area to see them at work. There I met my mate Jon Davey! Jon is a Doctor Who monster actor who has been in over 30 episodes and I’ve met him a few times now. I always like to try and spot Jon when I watch a new episode. Recently he had a staring competition with Doctor John Disco in The Zygon Inversion (2015). In Series 9 he also played The Mire and I got to try on the costume! It was dark inside and my eyes couldn’t reach the visor so I couldn’t see a thing. It was really fun and I’d love to make a Mire costume at home for a Cosplay, I think I would need some help from the guys at MFX though. Check out this video of all of Jon’s performances in one go – it’s awesome! I have big ham hands! You need to brush your teeth young man! The last talk of the day was the Millennium FX Show with Special Guest Mark Gatiss. Mark is a writer and actor, he has appeared as both Professor Lazarus and Gantok in Doctor Who and written 8 episodes. Fact fans – 38% of Project Indigo readers chose Mark Gatiss’ episode Robot of Sherwood (2014) as their favourite episode of Series 8! In the show Mark and the MFX Team talked about how they create the monsters and take them from script to screen. Mark came up with an idea for a parasite that feeds off of parts of the brain that we don’t use and two designers created their own versions on the stage. Who’s the handsome man with the ginger beard on the big screen? Mark Gatiss! Who’s that red handsome man with all the teeth? Mr Sweet! Mr Sweet from The Crimson Horror (2013) made a guest appearance and Mark explained how he worked. Mr Sweet was much more cheerful in real life and seemed really cute. Next they brought out The Mire, and Mark Gatiss threatened to show the ugly creature inside. He took of The Mire’s head and underneath was …. Jon Davey! A volunteer came onstage and Jon taught him how to move like an Ice Warrior. Jon has been in many episodes so has lots of experience. Beware the scary monster – Jon Davey! Mr Sandman – bring me a fright! All of the sudden the lights turned out and a Spoiler Alert came out from behind the sofa! It was a Sandman from Sleep No More (2015), Mark’s latest episode that was airing that day. 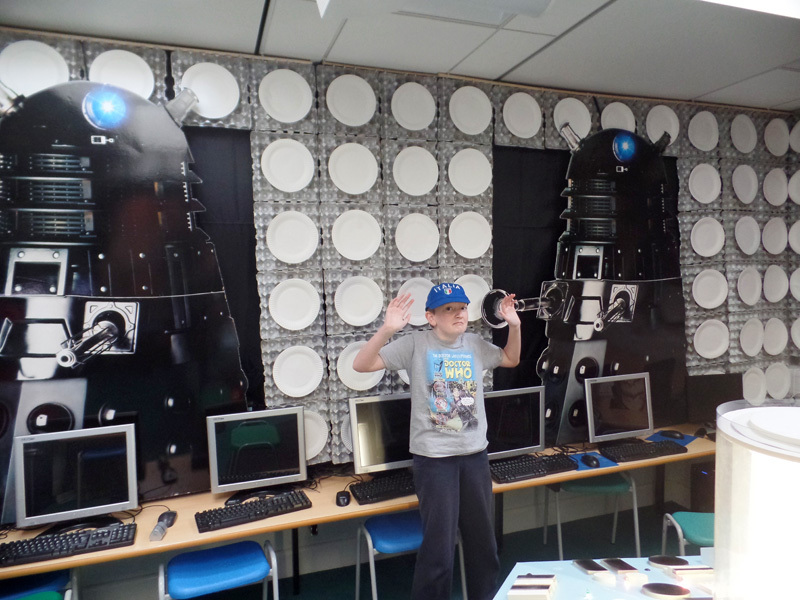 The final thing I did before I left was play The Doctor and the Dalek. I played a custom level that had been created by another guest and had to shoot Daleks. I was having a great time playing but sadly it was time to go. I was really sad to leave but I hope they do another Festival one day. The Doctor Who team have really made their fans happy. On the way out I met a man who had his photo taken with Michelle Gomez and he was so chuffed that it made me so happy to see how happy he was. 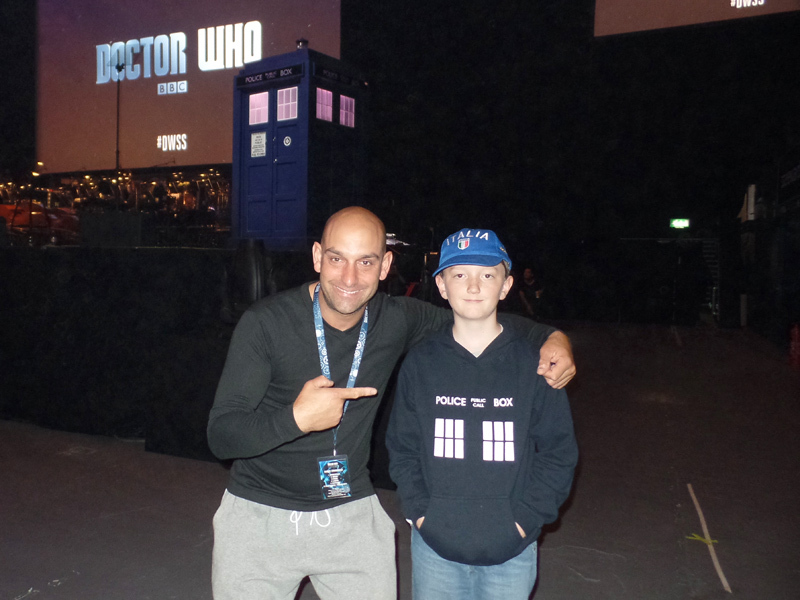 This event was something that Whovians will remember for their whole life and I was ecstatic to be part of it! See you again for my next adventure – a Classic Doctor Who location next time. Rattle n hum back soon! Laters! I’m going to scare Odin with this! Recognise this? The Viking set. Reading my Festival Handbook on the way home. Happy memories! Croeso and welcome to the West Wales Museum of Childhood in ….West Wales! 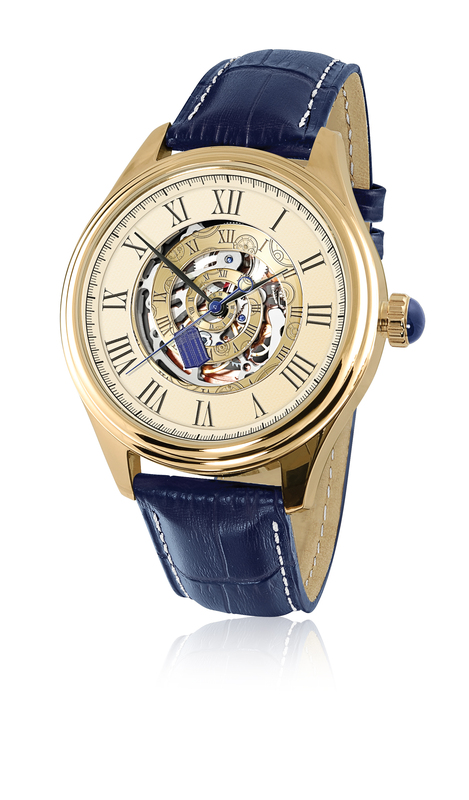 We are travelling back in time to August 2015 for a trip down Memory Lane. 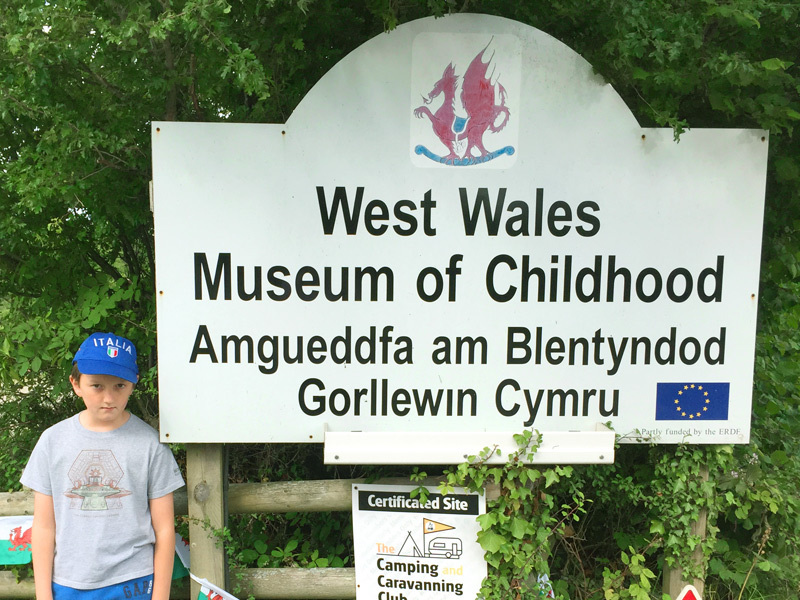 I visited the West Wales Museum of Childhood during my summer road -trip around Wales, and I popped into the museum when I was leaving Newcastle Emlyn on my way to visit Conwy. 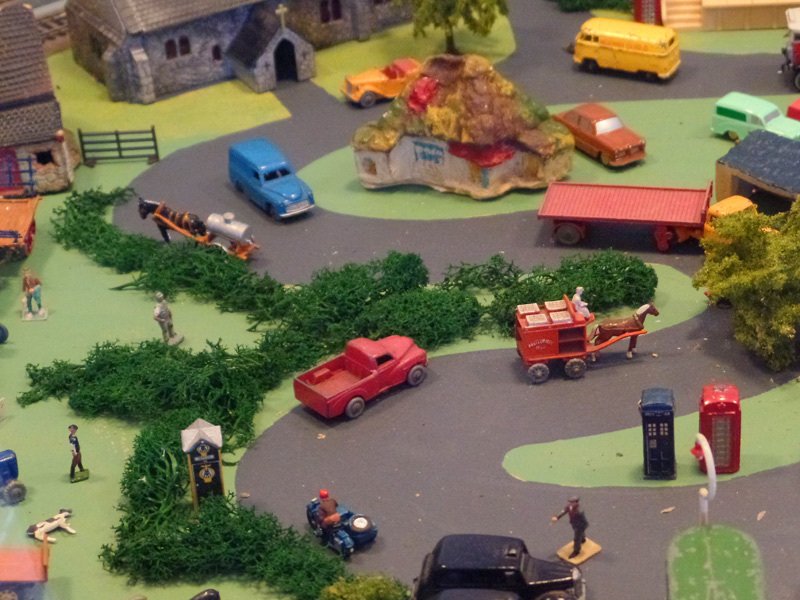 I got a big surprise when I discovered there were a lot of Doctor Who toys there – I was expecting all the toys to be old fashioned. 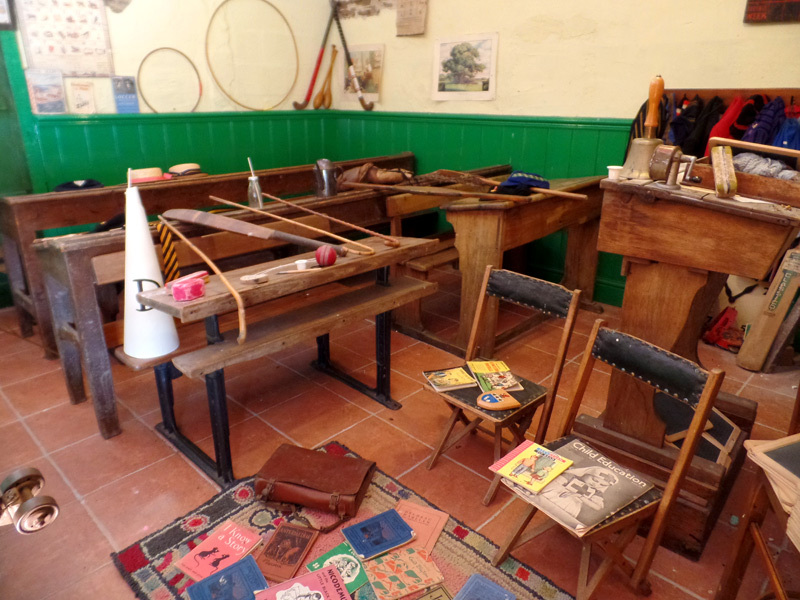 The West Wales Museum of Childhood is at Pen-ffynnon, 1 mile from Llangeler in Carmarthenshire. There is a tea room and a gift shop and the museum has 10,000 exhibits! A warm welcome is offered to ‘everyone who is – or ever has been – a child’. 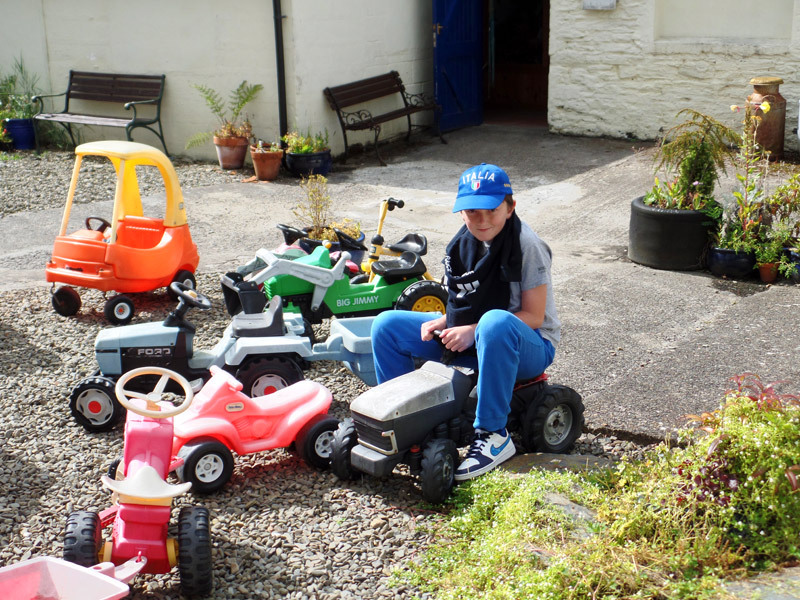 The museum was created by Paul and Hilary Kennelly and Vic Davey to display the toys and memorabilia that they have been collecting for most of their lives. They bought the farm, Pen-ffynnon, in August 2002 and gradually turned it into the place I am reviewing today. I had a good chat with Hilary and she told me that she met the Third Doctor, Jon Pertwee, many years ago when he was playing Worzel Gummidge. Can you guess what decade this is? When I arrived I went into the ‘Oriel Amser’ (Gallery of Time ) which is a timeline of the 20th Century with memorabilia and displays of toys to look at. Next to this is a stable where you can see costumes and traditions from Wales, and an antique toyshop window ‘Siop Deganau’ displaying Welsh toys. Next door is a barn full of little metal toys and an old school room that shows you what school was like in Wales’ old days. Next is the carthouse which contains train sets and a huge collection of Action Man toys. Hope I don’t have to wear the Dunce’s Hat! Finally we come to my favourite bit – the Doctor Who stuff in the Television and Film Gallery! This was originally the kitchen in mid-Victorian times. It contains lots of merchandise from film and television over the last 60 years. 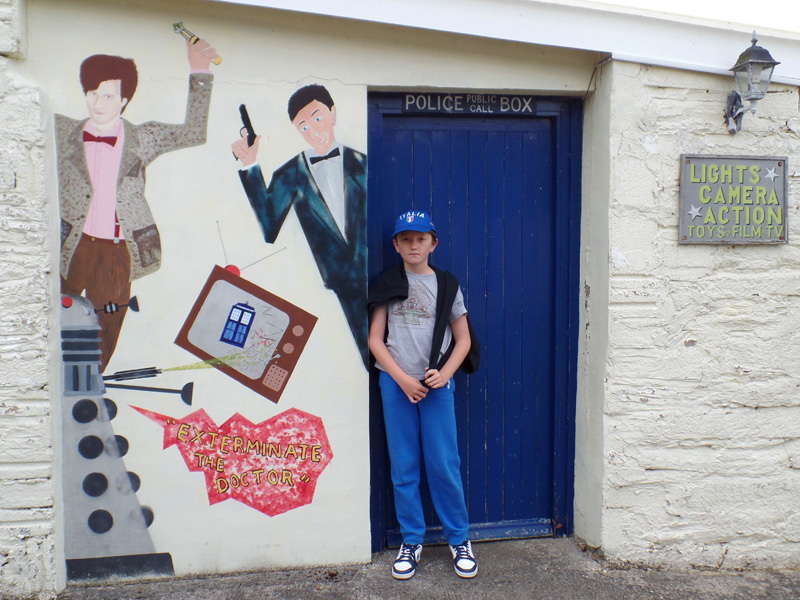 At the entrance is a magnificent mural painted by Paul, depicting a Dalek exterminating a TV , whilst the Eleventh Doctor and James Bond have a sonic weapon-off! 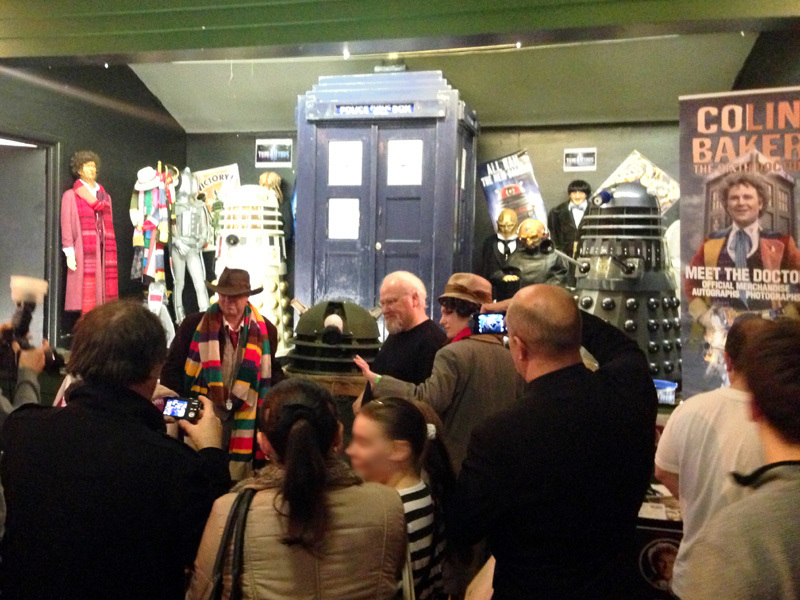 The room is crammed with Sci-Fi treasures including an original Dalek Dress-up suit from 1965. I dressed up as a Cyberman but deleted nothing as I was a good Cyberman. 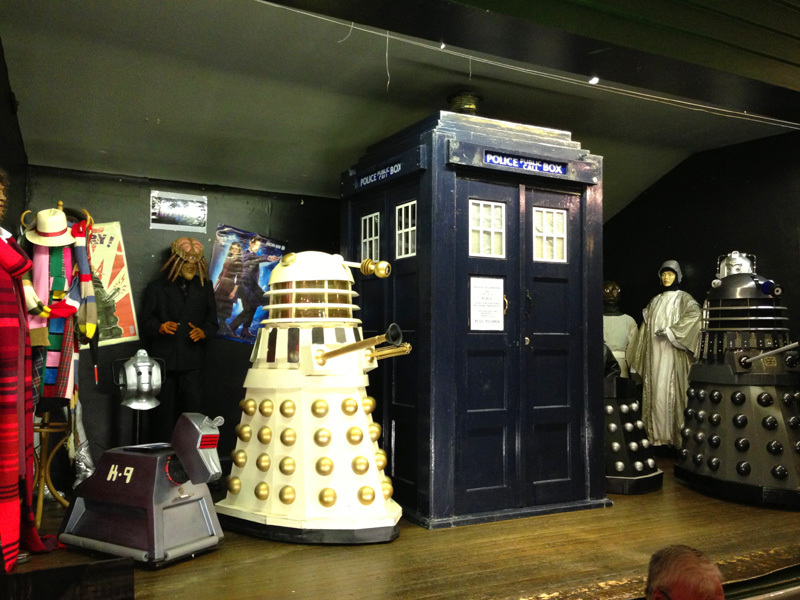 I would recommend any Doctor Who fans who live in, or visit West Wales, to go and see this collection. There are A LOT of special Doctor Who treasures to treasure which have been happily collected and displayed for you to enjoy. 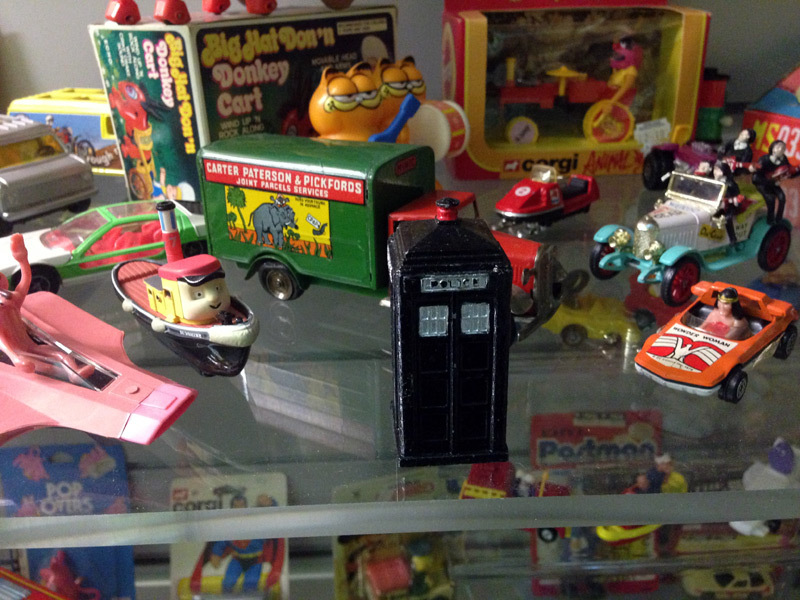 It was lovely to look at the toys and imagine what it would have been like to be a Doctor Who fan 50 years ago and I even saw some items from my own toybox. A Matchbox collection – spot the Robot! What are you doing up there K-9? This museum was an amazing place to visit and I really enjoyed riding on the kiddy cars. If you are ever in Carmarthenshire make sure you stop off and see it for yourself! 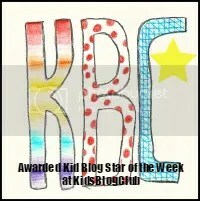 If you have been already please leave a comment and tell me what you liked best. I’m a little kid again! In other news, I am off to London this weekend to go to the Doctor Who Festival! There will be lots of stars there including Peter Capaldi, Jenna Coleman, Michelle Gomez and Ingrid Oliver. I hope you will come back soon so I can tell you all about it. Hello? Is someone there? Ah! Readers! 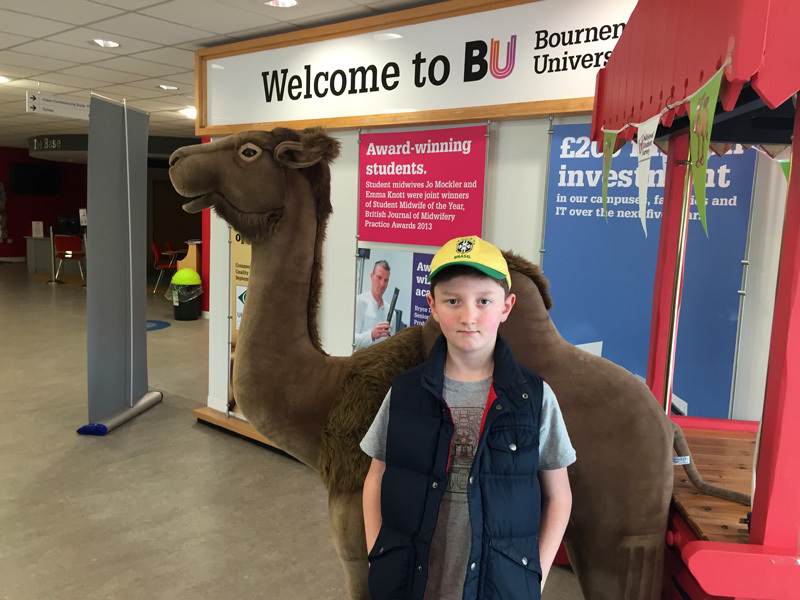 Thank goodness you’re here, you are just in time for another post – all about the Bournemouth Invasion! 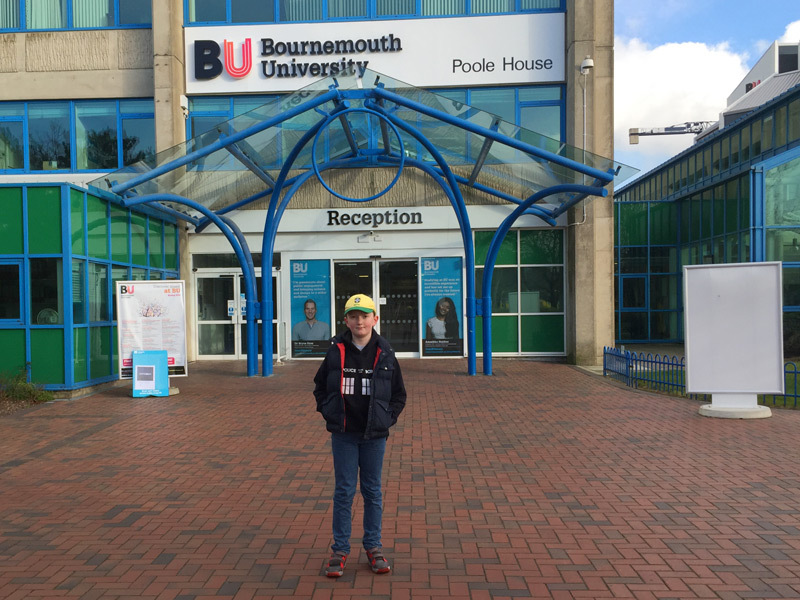 Yesterday I went to the Bournemouth Invasion – the first Doctor Who convention to be held at Bournemouth University, hosted by the Bournemouth University Whovian Society. 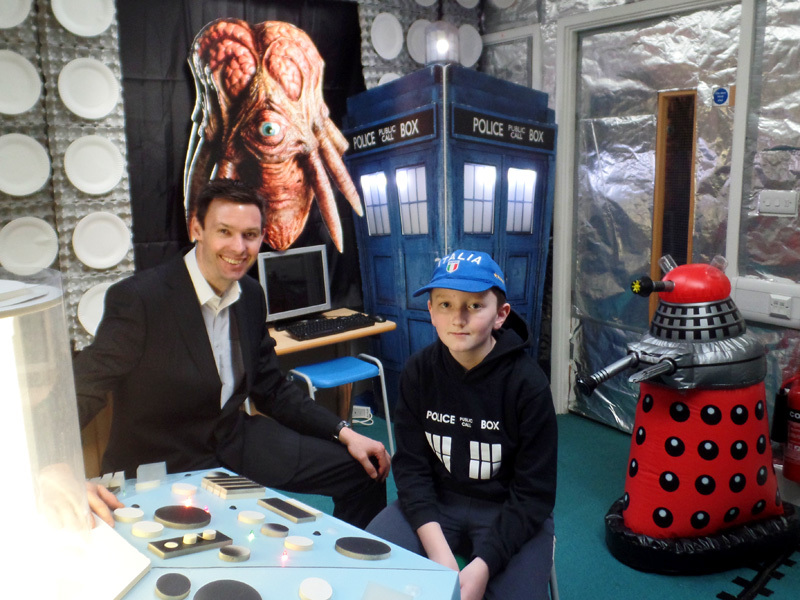 The event was set up to host an excellent Doctor Who convention full of special guests, talks, quizzes, autographs and pictures and also to raise cash for Cash for Kids. As soon as I arrived I went to a talk by my old pal Simon Fisher-Becker who I had met at DEFCon 3. Simon is best known for playing Dorium Maldovar alongside the Eleventh Doctor and is the ‘best blue actor in the business’! His one-man show is called ‘My Dalek Has a Puncture‘ and is all about his life and is full of advice for anyone who wants to be come an actor. Lauren Wilson who played Daughter of Mine in the two-parter Human Nature and Family of Blood (2007) was in the audience. I hope she got some good tips! 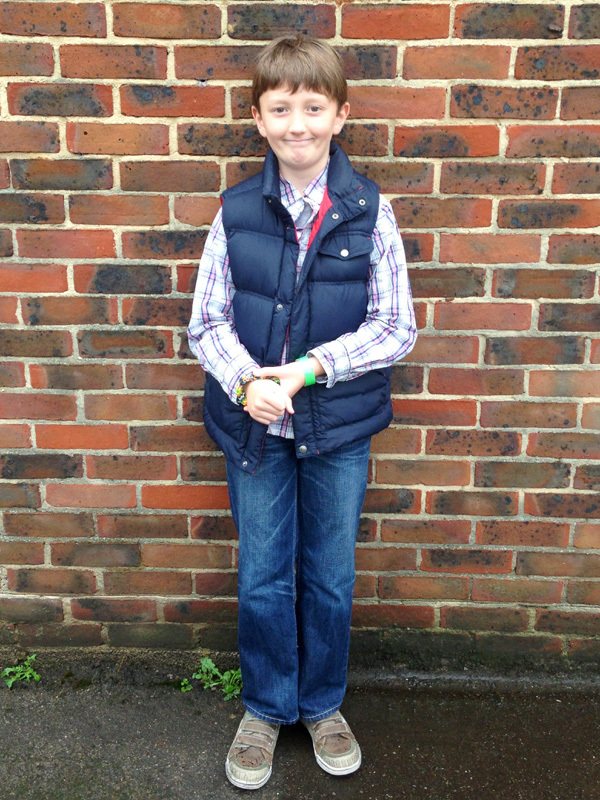 Simon spoke about his childhood in South Ruislip. He was bullied horribly when he was a child and he learnt to always look for the silver lining. I hope his bullies are ashamed of themselves. Doctor Who started two days before Simon’s 2nd birthday and he would watch it with his grandfather – little did he know that one day he would be a Doctor Who actor himself! 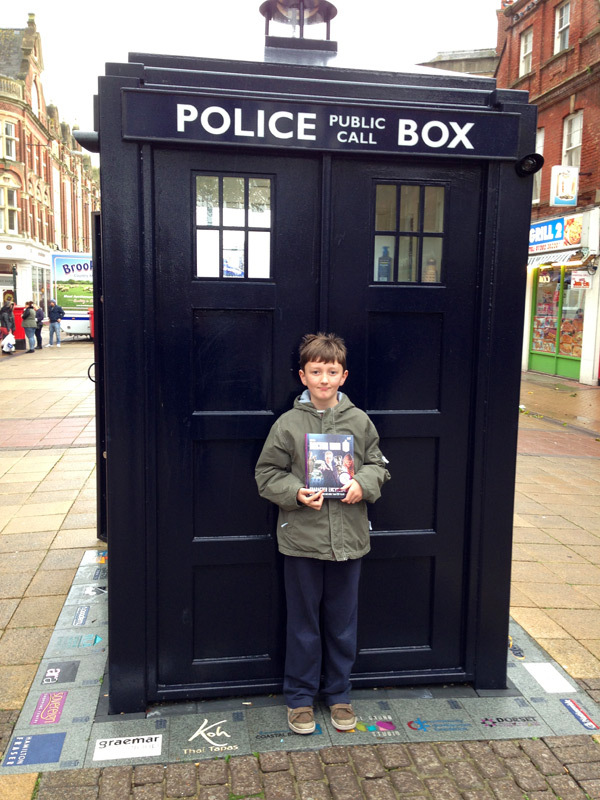 He lived near a Police Box and would look out for the Doctor but never saw him. Simon has had many other jobs including the Civil Service, an Event Organiser, a deputy Town Crier and an ‘Ugly’ model. I also found out that he used to play Sir Topham Hatt from Thomas the Tank Engine! 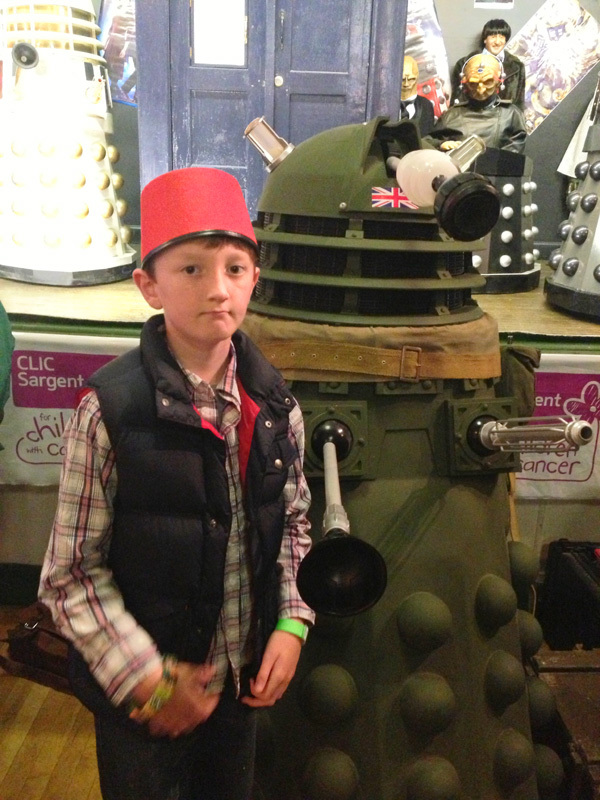 I enjoyed ‘My Dalek Has a Puncture’ – it was funny and a bit fruity! If you get the chance you should definitely go and see it. 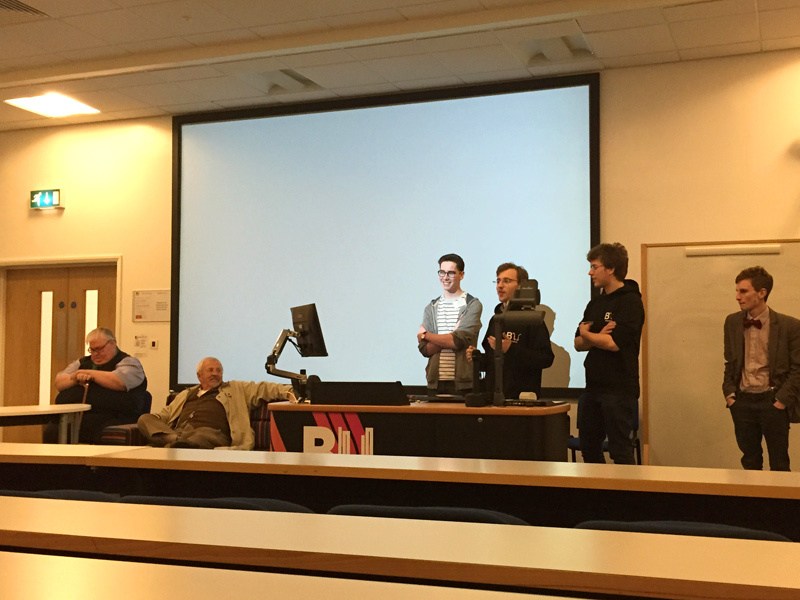 After the talk I went to do the Ultimate Franchise Quiz No 1. I was playing on my own and I was a bit shaky ; I didn’t do very well! The picture round was my best round but two of the rounds weren’t about Doctor Who and I didn’t know the answers as they were about things like Star Trek, Marvel and Firefly. 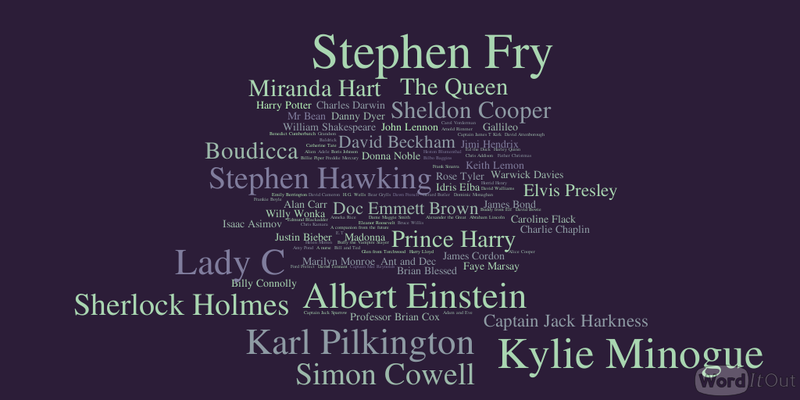 The Quotes Round was really hard too. I did enjoy it though – even if I wasn’t very good. 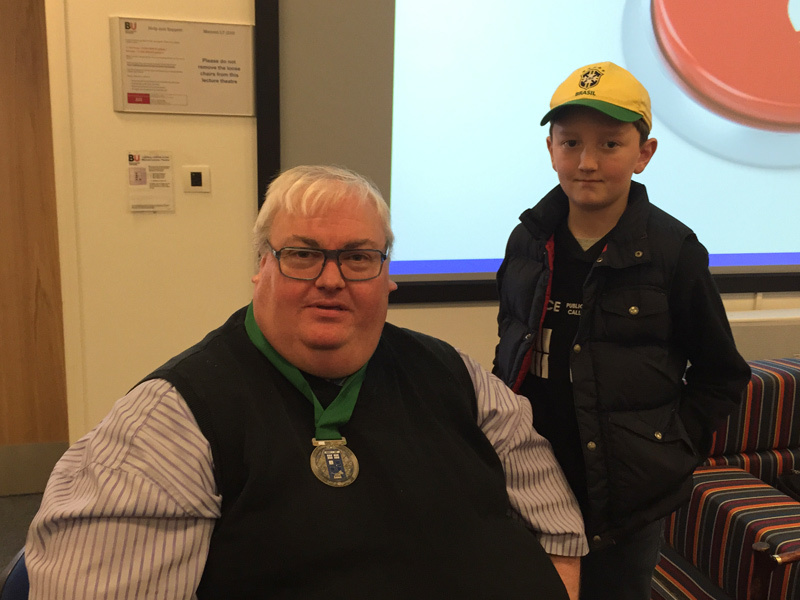 Congratulations to one of my companions who came first with a score of 31 out of 50! Lunch was next and I got to watch a bit of the Middlesborough v Leeds match whilst I ate a veggie burger in the Student Bar. I got back from lunch too late to see Andrew Cartmel‘s talk and I was sad about that as I was looking forward to hearing about the scripts for the Seventh Doctor who is, as you know, my favourite Classic Doctor. I did get to say hello to Andrew though, and he remembered me from the SF Ball 21. In one of the rooms there were lots of games including a raffle, Guess How Many Jelly Babies in the Jar and ……PLANET PONG!! YEAH! 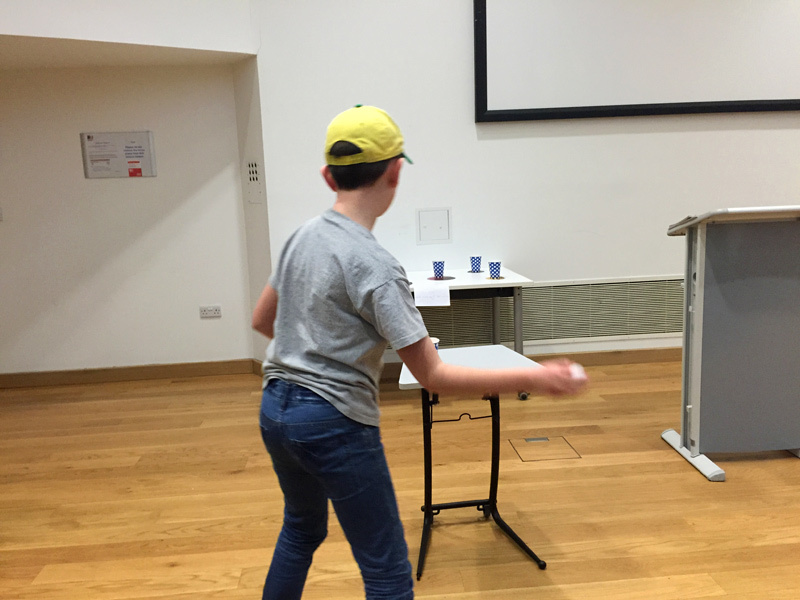 Planet Pong was a devilishly difficult game that involved bouncing a ping-pong ball off a table to land in a cup. Each cup represented a planet and there were pictures of them under each cup that looked like pancakes. I had several tries and I was determined to do it – but I was defeated. By a cup. 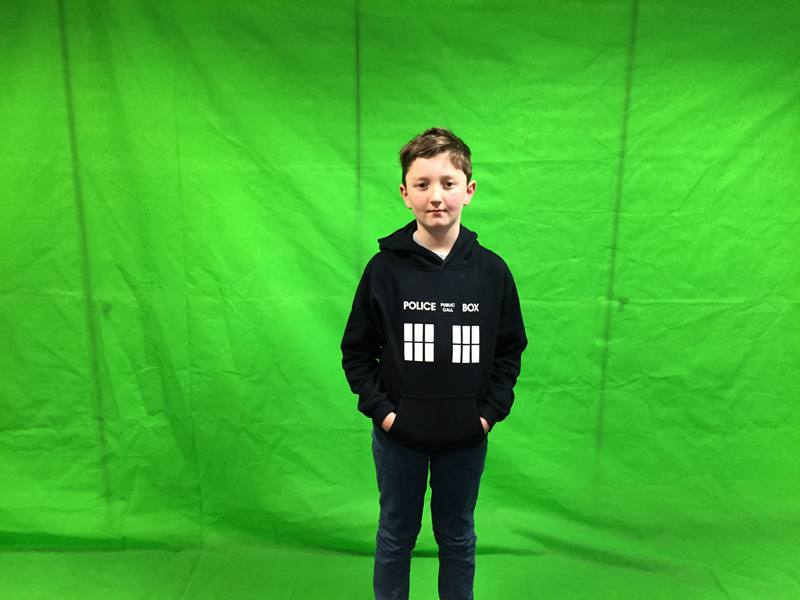 Next I went upstairs and went to a room which was set up with a green screen and I got to pose for some photos and chose a TARDIS background. I’m looking forward to seeing the finished picture and will update this when I get it so that I can show you too! 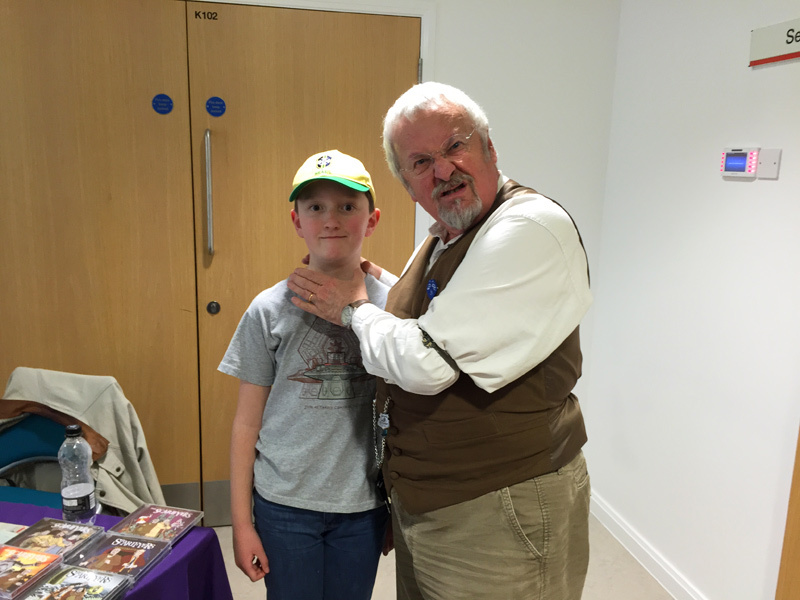 Then it was time to meet Terry Molloy aka Davros! I had already met Terry at the Timeless Collectors Fair but this time I got to spend more time with him and chose a fantastic picture from Revelation of the Daleks (1985) for him to sign. I asked Terry my 3 golden questions. First I asked him where he would go if he could go anywhere in time and space . 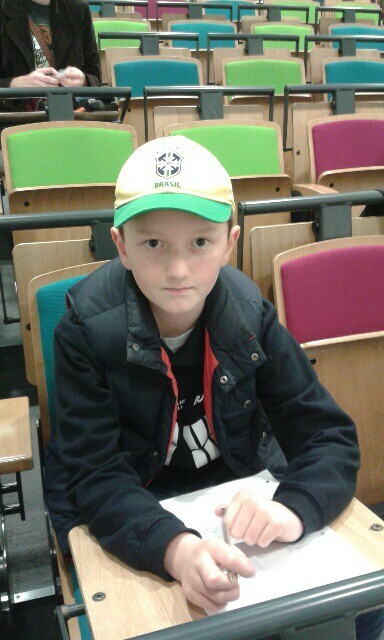 He said that he would like to travel back to Ancient Rome to see Julius Caesar or to the time of Richard III. His favourite episode of Series 8 was Listen (2014) and Terry said that Peter Capaldi is a really good Doctor – just as Terry expected. 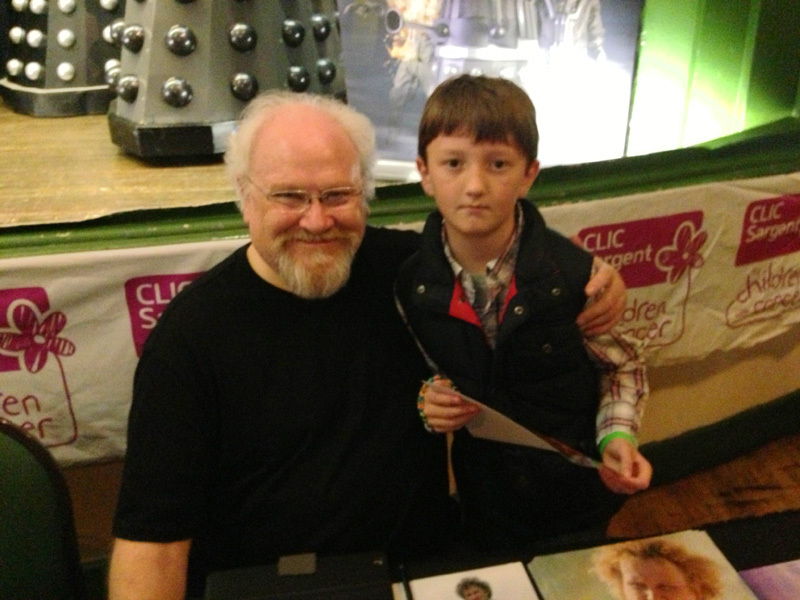 I asked him about his favourite filming location but he said all his scenes as Davros were filmed in a studio. His favourite filming location ever was when he filmed Carrott Del Sol in Spain for six weeks with Jasper Carrott and Bernard Latham. 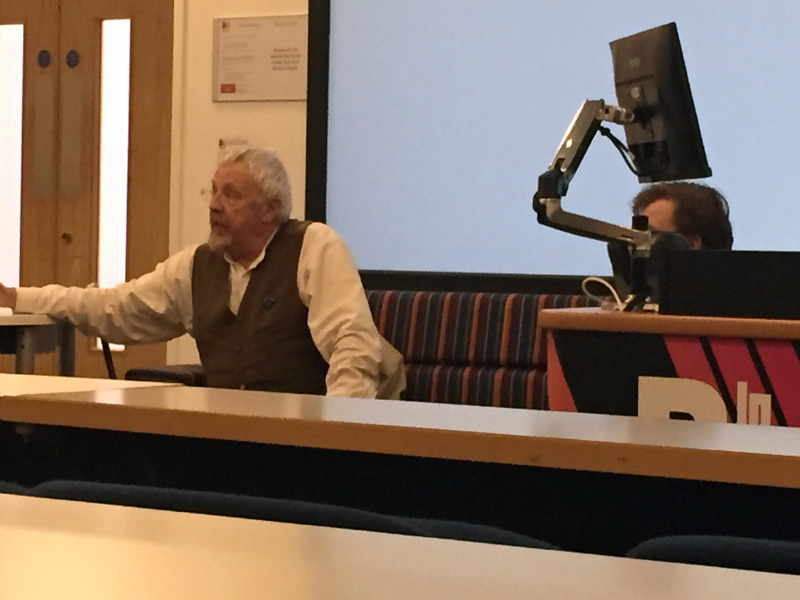 After I met Terry I went to the park for a quick play then came back for ‘I, Davros’ a Q&A session with Terry all about Davros and his career. 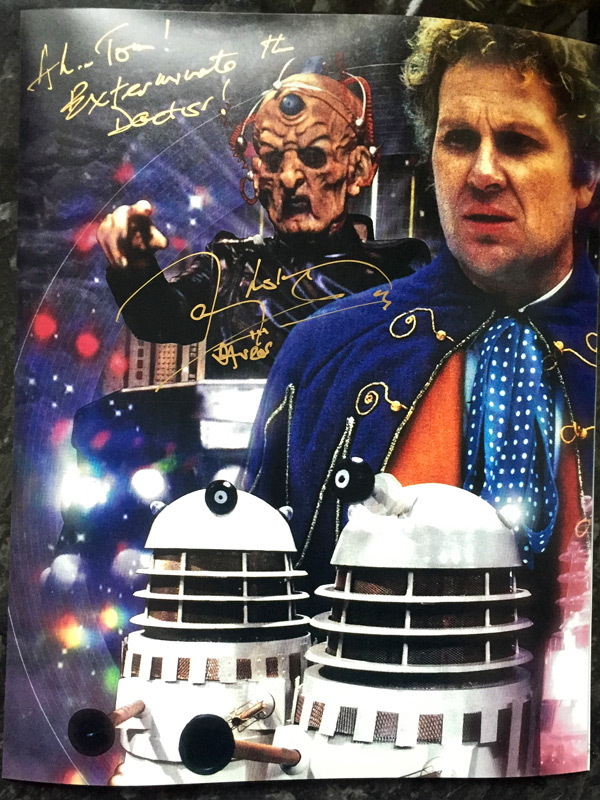 Terry was asked about any memories of playing Davros – he said he remembered pain, claustrophobia, sweat, no peripheral vision and dragging a shopping trolley around with his toes! Davros was a physically challenging role that was hard work but great fun. The 5 people Terry would like to go out on the town with are Leonard Rossiter, Aneurin Bevan, Michael Palin, Charles Darwin and Jacqueline Du Pre. He also mentioned someone he would like to roast for dinner – but I’m not telling you who! 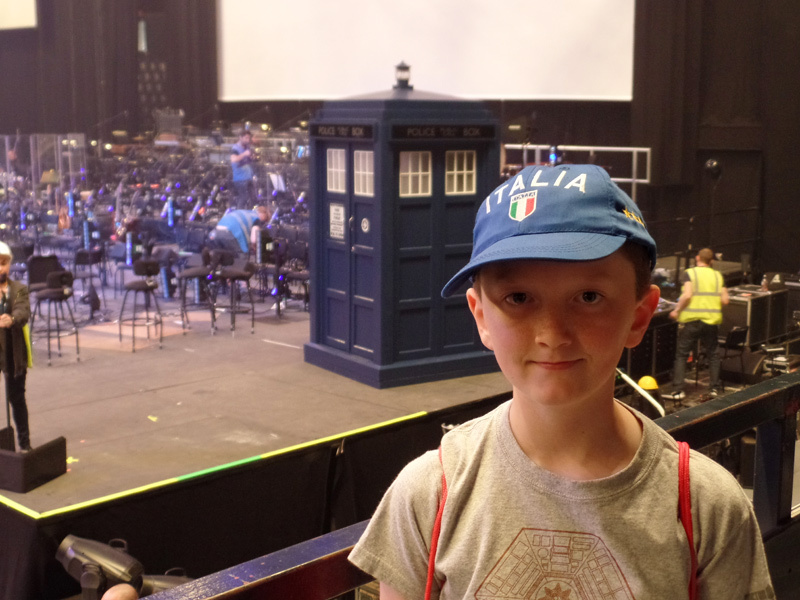 He likes Doctor Who because it is quintessentially ( I had to look that up!) British and that he would love to throw the Sonic Screwdriver into a black hole because the Doctor only needs to use his brain power. Terry said there would be a test on nuclear fission at the end – I’m glad he was only joking. 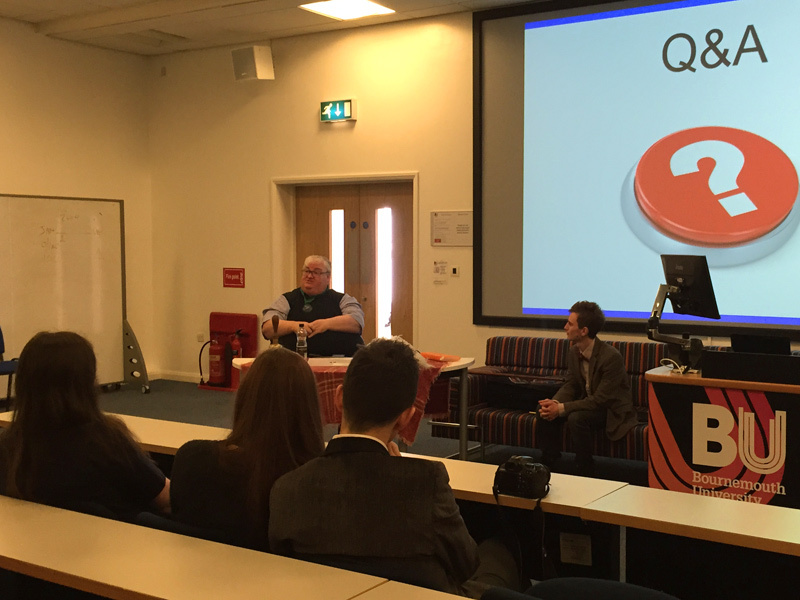 I thought his Q&A was inspiring and I really liked Terry – he is not at all scary like Davros! Next I went to do my second quiz of the day – this time it was a Team Quiz so I felt a bit more confident with my two companions at my side. I enjoyed all the questions, it was more fun conferring with my team mates. The Quotes Round baffled us for a second time but we still breezed through and were joint winners in a 3-way tie with a score of 35 out of 50! Finally came the Closing Ceremony of this Whovian Convention and we all gathered together to thank everyone involved in this amazing event. Terry and Simon said they were pleased to be part of a first time convention. I hope this will be the first of many to come as I thought the day was phenomenal and everybody worked so hard to make this such an enjoyable day. Thank you BU Whovian Society! Thanks for reading, and see you soon for another location report. Until we meet again, goodbye! This is my first post of 2015 and I hope it is a good one! On New Years Day I went on a short holiday to Warwick and while I was there I wanted to visit some Doctor Who locations around those parts. I went on to the fact-filled Doctor Who – The Locations Guide and discovered that filming for The Shakespeare Code (2007) had taken place in the area! I had already been to The Globe Theatre and now was my chance to explore more locations from The Shakespeare Code. 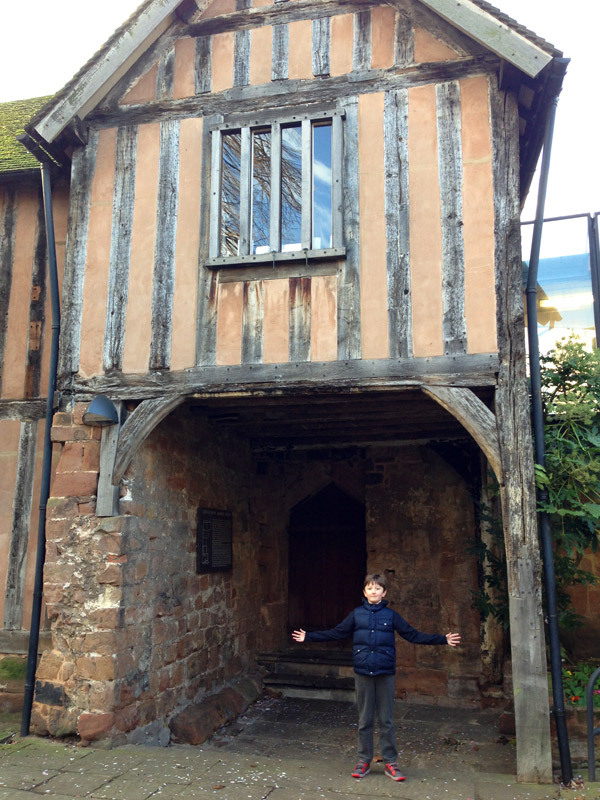 I had only just finished learning about the Tudor times at school so this was a surprise for me and I was excited about seeing some real Tudor buildings. The Shakespeare Code was Martha’s first time-travel adventure with the Doctor and he took her to Elizabethan London in 1599. My first stop was Cheylesmore Manor in Coventry which was very easy to find as it was very close to where I parked my TARDIS! Cheylesmore Manor is now part of Coventry Register Office and while I was there people were arriving for appointments. What a cool place to have your wedding photos taken, it is the oldest Register Office building in the whole country and opened as a Register Office in 1968. The current building is only part of the original manor house. It was first built in 1237 for the Earl of Arundel and was then owned by Queen Isabella, Edward II’s wife before passing to her son Edward the Black Prince. I could immediately recognise the building as All Hallows Street, home to the Carrionites. I was most excited to see the window which Lilith leaned out of to watch Wiggins sing to her. Later in the episode she escapes out of the window with her doll of the Doctor leaving him for dead, and levitates outside . Luckily there weren’t any psychokinetic Carrionites around while I was there! Next I found my way to Ford’s Hospital, a few streets away. The exterior was used for The Elephant Inn where Shake-a- spear stayed. Ford’s Hospital was built in 1509 by local merchant William Ford. It was constructed as almshouses for men and women. An almshouse is a house which is funded by charity for poor people to live in, usually elderly people who can no longer work. After 1800 it became a home for women only. Unfortunately the building was hit by a bomb during World War 2 and sadly eight people died. The building was restored in 1953 using original materials. You can see through to the courtyard which was used in the episode as an Elizabethan street although I didn’t go in because it is private and still used as sheltered accommodation. If you would like to see some photos taken during filming please see the Historic Coventry website. 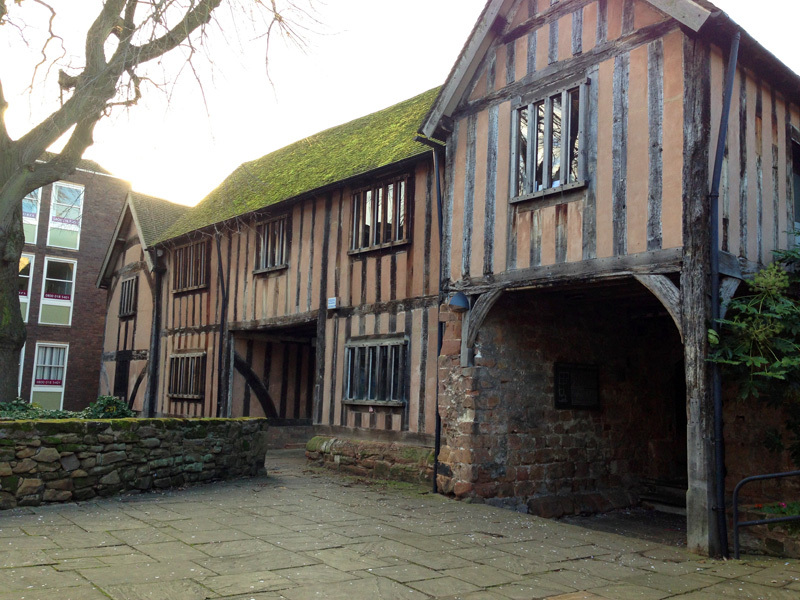 It must be so cool to live in an original Tudor building! I wonder what William Ford would say if he knew his almshouse would still be there in 500 years? 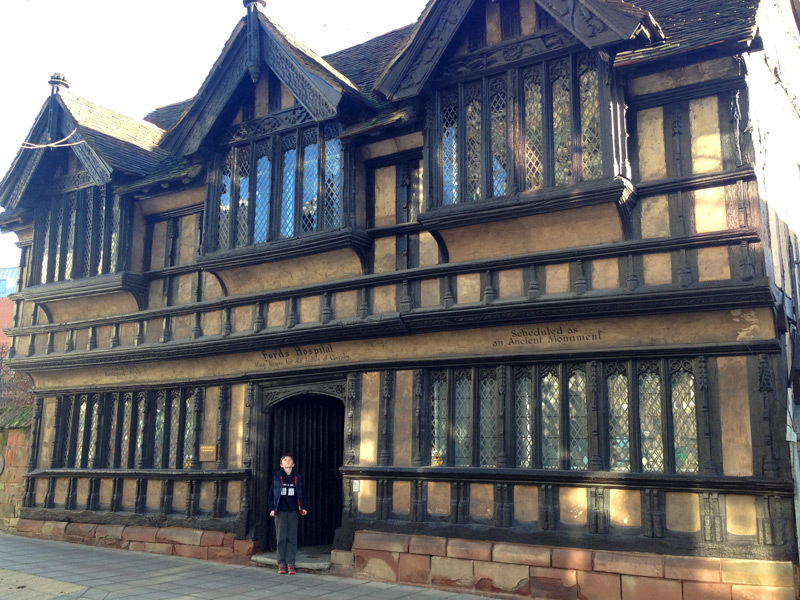 After Ford’s Hospital I spent a few hours exploring Coventry. 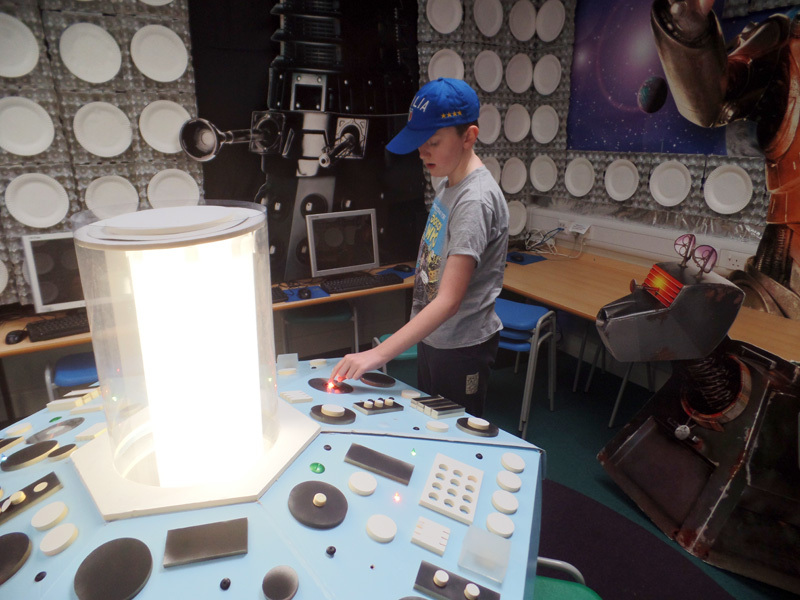 In the afternoon I went to the Coventry Transport Museum and I found a tiny Time And Relative Dimension in Space! The TARDIS was part of a big collection of models collected by a collector called Tibor Reich and has been shown on Blue Peter. 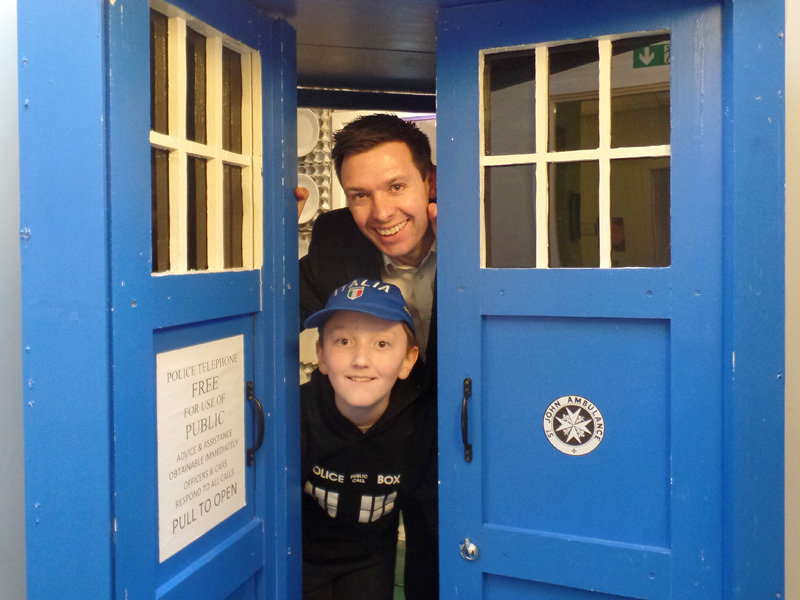 If you ever get a chance to go this great museum see if you can spot the TARDIS too! 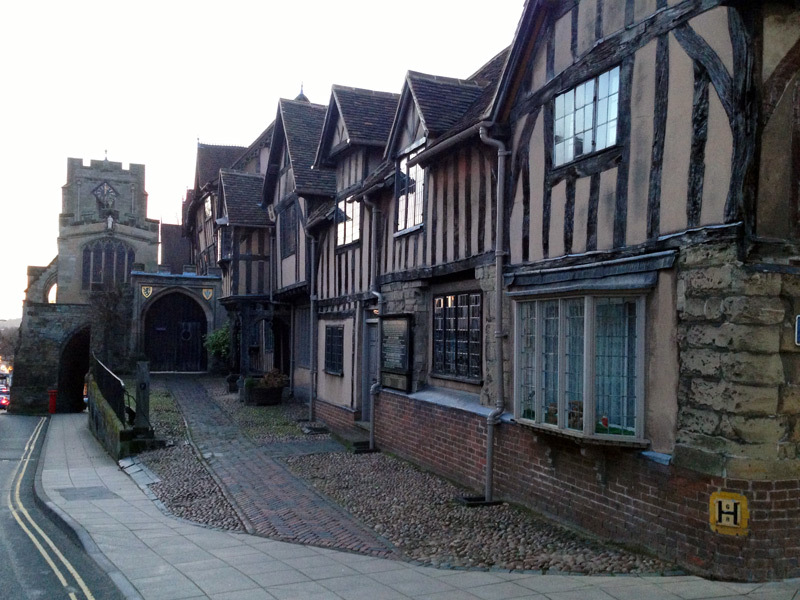 Late that afternoon I returned to Warwick and went to The Lord Leycester Hospital. Like Ford’s Hospital it is not a hospital for sick people as we would know it, the word ‘hospital’ meant “a charitable institution for the housing and maintenance of the needy, infirm or aged” in Tudor times. The buildings date back to the 14th Century but became a retirement home for old warriors during Elizabethan times. Even today the building still provides homes for ex-servicemen and their wives. I recognised that this was the location where the TARDIS and the Doctor and Martha arrived in Elizabethan London and Martha asked “when are we?” – a useful time-traveller phrase which she used for the first time. They narrowly avoided being covered in pee when someone emptied their chamber pot out of the upstairs window! The outside of the building was used for the street scenes and the area outside the Elephant Inn. The Doctor and Martha were chased back there by Queen Elizabeth I’s guards and the TARDIS was hit by arrows ( like in Robot of Sherwood (2014)!) 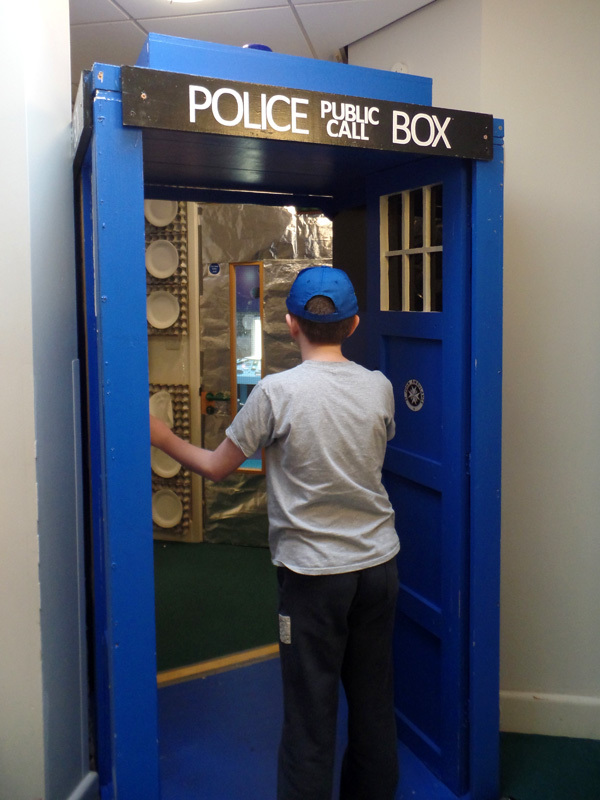 but luckily the TARDIS de-materialised in time! 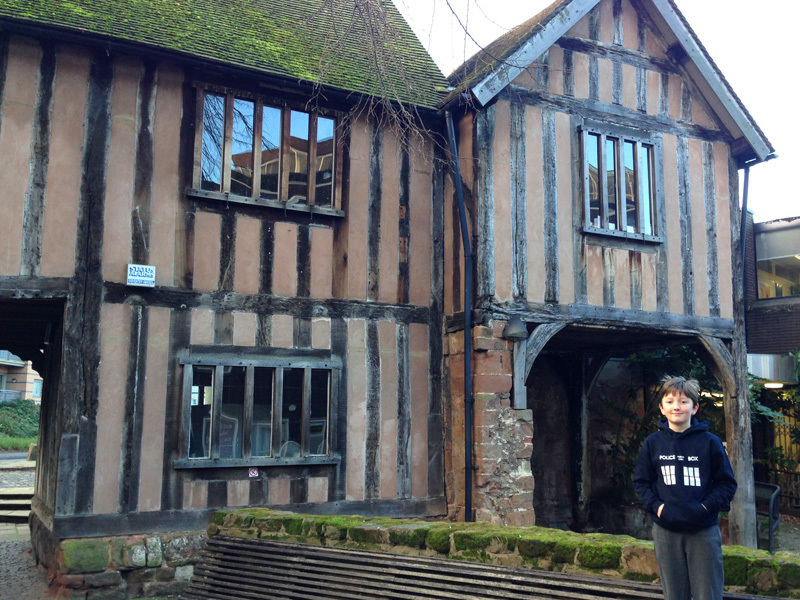 I had a great day in Coventry and Warwick and hope you enjoyed reading about it. I hope I can go back that way another time and check out more Doctor Who filming locations. Thanks for reading and I hope you come back soon to check out more of my adventures through time and space! Parting is such sweet sorrow! Goodbye!